SC 1510 – Sky Blue: It is decorated in a variety of shades and sizes of dandelions all over the lightweight scarf for a contemporary look. 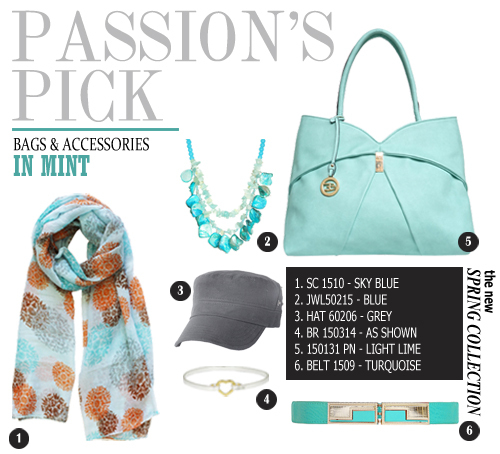 JWL 50215 – Blue: This necklace is a great piece to for those that love the bohemian feel. Wear this on your casual days along the beach. HAT 60206 – Grey: This hat comes in earthy tones and uses button snaps for decoration. BR 150314 – As Shown: This is the perfect gift for someone you love. A simple silver bangle with a gold heart. Belt 1509 – Turquoise: This sleek and chic looking stretchy belt is a great accessory when wearing one piece dresses.